Is the Grievous/Separatists Rework Satisfactory? Griffith's rework is stupid and ridiculous. Instead of using physical health to replace physical damage, there has never been a game like this! The ultimate goal of EA was reached, just let Griffith sell to the store, and found a good reason to sell it, including the video, haha, in fact, everyone has been fooled! Many players have already left, I want to say that the most important thing to leave is the planners of this game. The same nature and contradiction of various characters are all the time. Now what is the balance is not clear! It’s two words! ! ! This game is fun, it's Bravo Sierra like this that ruins it. Why would they do stuff like this?! I don’t understand why they bothered. Who in their right mind is going to intvest in a team who’s only use is GA and TW? More over, a team that needs at least 3 zetas to be effective (b1,b2 & grev). The rework is not bad. It made a previously unfun squad fun to use. In a game that is all that is important. Mate, I appreciate your optimism. But Arena gives crystals and Arena currency to use to grind other characters. Even in territory wars they won't hold up and in tw you also get rewards... So tell me mate, help me understand what is fun? Better than before?! After reworking 3 and releasing 2 new ones...that’s a very minimum expectation. And they nailed minimum on the head. The issue is that's not what the videos of the reworked Separatist team was promoted as. That's why people are bothered by it. Look at the release of Bossk - that's how this should have been done. CG made it clear what Bossk was and was NOT supposed to be/do. This time, CG intentionally mislead the player base on GG and the Sep. rework. That's why people are frustrated. I still wonder why those guys at YouTube are saying, that the team is such great in offense. 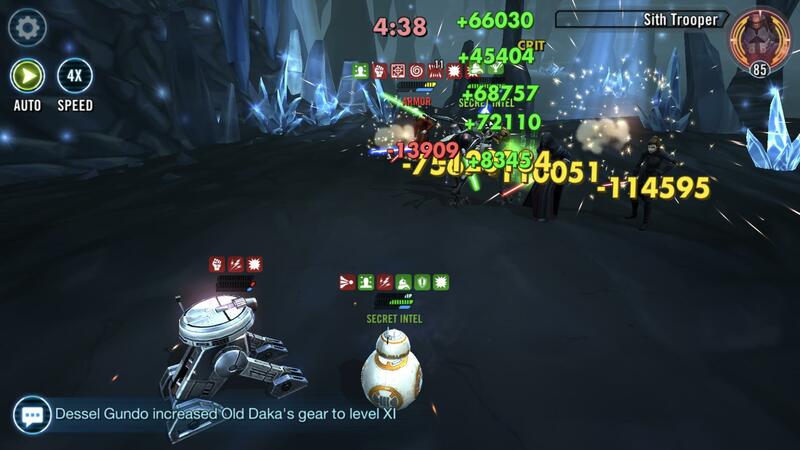 I'm using GG on arena and I can sometimes beat Revan - that's completely rng dependant (no buff immunity on gk, cooldown on b2 not reduced, wrong char marked etc). I definitely can not beat Traya, and fighting CLS is a joke as it decimates GG like hell. I have 4 most important zetas and pretty decent mods. I would really like an explanation on how anyone thinks that it exceeds expectations or that it's great on offense. The frustration also comes with completely unusable leader abilities, of completely stupid and unexplainable skills, like killing light side droids, of not being able to use GG outside of separatists (cause he needs to kill droids to get better), like forced taunt on own droids, that's also unusable cause well Revan can still taunt anyone he wants to and the list continues. So while I'm playing him on arena, each fight I wonder how will my own leader screw my own team this time, or I watch how all my debuffs are constantly dispelled or dodged etc etc. Yeah fun indeed. But yet I still use him cause I've waited so long for this rework, and I trust that finally maybe some miracle will happen and maybe he will start winning one day. But being a realist I know it won't happen cause of course other people know better what players want from the game. Marvel Future Fight uses max health to determine damage output for the character Victorious, so this is not the only time in gaming history this has ever happened. GG and the separatist droids is one of the best teams out there. I use it every time to kill the best FO teams and sometimes some really good BH teams. This thread is from a while ago... I’ll change the name to match the discussion. I think a lot of people just gave up on them with all the negativity surrounding their rework on the forums and failed to realize their potential.